This week’s Object made its own strange journey before reaching a safe home in Special Collections. 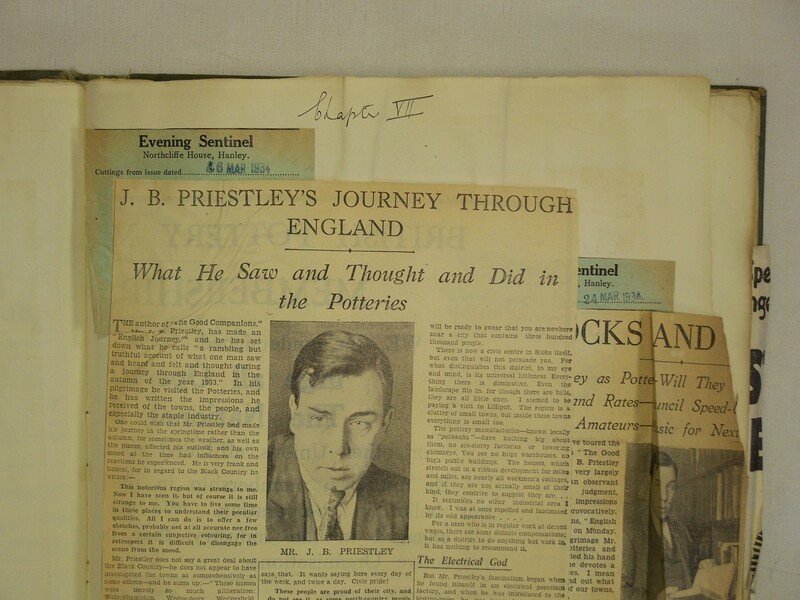 It is a bulging scrapbook of press cuttings and correspondence documenting the marketing of J.B. Priestley’s English Journey (1934). English Journey is one of Priestley’s most influential books. As the subtitle explains, it is a “rambling but truthful account of what one man saw and heard and felt and thought during a journey through England during the autumn of the year 1933”. He travelled the country by motor coach, sharing his insights via some of his most memorable writing: the last remnants of old rural England, the new Americanised world of arterial roads and cinemas, and the terrible deprivation of people in the inner cities. The book has been reprinted several times with new illustrations (most recently by Great Northern) and has inspired other writers and artists e.g. Beryl Bainbridge, who retraced Priestley’s route in 1983. And what of the scrapbook? Discarded in a skip during the clearance of Priestley’s home Kissing Tree House, it was rescued by one of the workers who later took it to New Zealand. A few years ago, he contacted the Priestley Estate about it, and eventually arrangements were made to get it back to England. We were delighted when it turned out to to be a record of the huge and skilful marketing campaign by Heinemann in March 1934. The publishers knew the book’s candid observations about individual places by a famous author would provoke comment and therefore sales in those places. To stimulate this interest, review copies were sent to the editors of regional newspapers with individually tailored letters pointing out the highlights from their perspective. It worked! The stark picture Priestley painted of deprived social conditions in industrial areas such as Coventry and Birmingham caused a furore in the local newspapers, all recorded in the scrapbook. Stung by the criticism of their towns, local citizens responded vigorously to Priestley’s comments, suggesting that he had no right to comment as someone who had visited only for a short time. On Middlesbrough, the paper exclaimed “This town is not a dismal place”, as Priestley had suggested. The town clerk commented “For a man who has spent less than a week in an important county borough to criticise it in such a derogatory manner was the height of impudence”. “My great respect for Mr J. B. Priestley has been increased by his latest book … I feel he is using his great influence unselfishly and helpfully. Instead of offering the profitable sweetmeats of fiction to his well-to-do customers, he gives them strong doses of medicinal fact”. 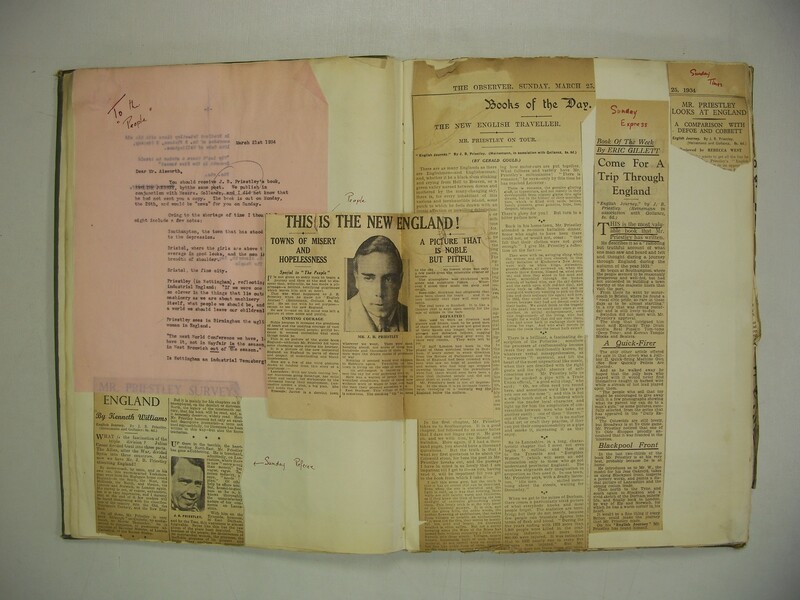 As these brief selections show, the scrapbook offers a wonderful record of the marketing and reception of English Journey and the debate it continues to inspire. (A longer version of this article was originally published in the Great Northern edition of English Journey). 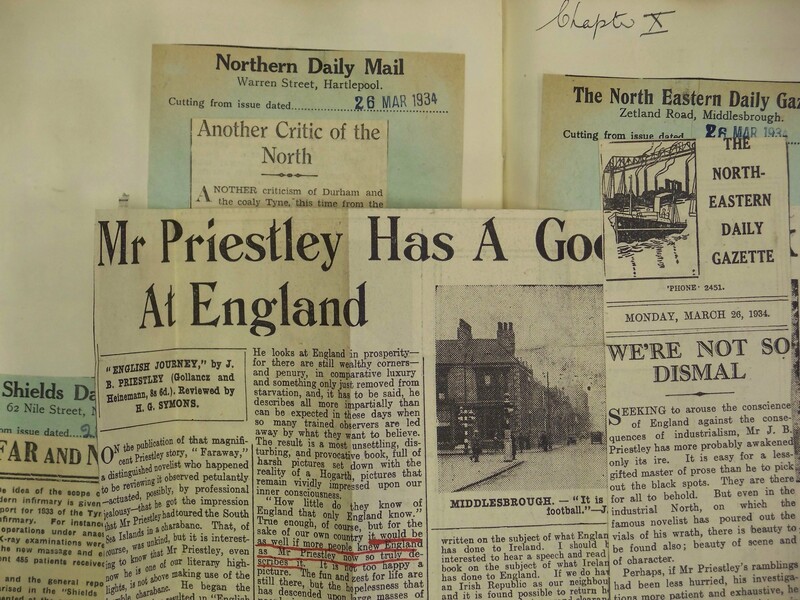 This entry was posted in Priestley, JB and tagged 1930s, England, English Journey, Newspapers, Priestley, Travel. Bookmark the permalink. Thanks for getting in touch. Journey into Daylight appeared in the Listener & we can supply you with a copy via our photocopying service. Please email special-collections@bradford.ac.uk for more info about what to do.